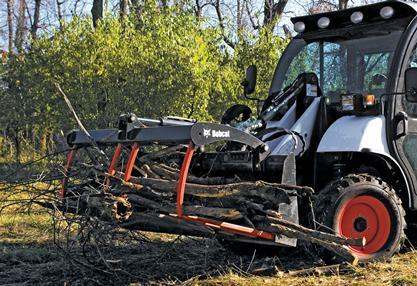 Handle materials easier and move materials faster with the utility fork attachment. The strong, replaceable, tapered teeth handle a variety of farm and ranch chores easily and efficiently. Use the exclusive Bob-Tach™ mounting system to quickly secure the utility fork to the carrier. For added versatility, pair the utility fork with the utility grapple. Sink into hard-to-handle materials with the bite of the utility grapple attachment. Scrape, lift, and move loose materials such as manure, bedding, and hay. Or get a grip on hard-to-grab loads such as posts and fencing. Bob-Tach™ Attachment Mounting System: Makes easy work of attaching and detaching the utility fork. Fast and easy mounting means spending less time on attachment changes and more time on the job. Replaceable Teeth: For easy attachment maintenance, utility fork teeth are replaceable, keeping the attachment working smoothly and maximizing time spent getting work done. Provisions for adding additional forks to narrow the space between fork tines.